Here they are! We supposed they were 4 or 5 but they have multiplied and they are 10, 6 boys and 4 girls! The fist one is born at home, the other ones to the vet ... I'm glad w have decided for the c-section because I don't think she could have delivered naturally so many puppies and we could have lost some of them and stressed the mum. I haven't weighed them yet, I'll do it tomorrow morning, but we have two big puppies, two "little spiders" and the other of medium size. Nione is quite perplexed, she watches them and try to lick them. She has few milk, I hope she'll have more within tomorrow but I'm afraid we'll have to help her with the artificial milk. Duty order for the first night: Erica will start and then I'll finish (now I need to sleep a little because I have a very strong headache). See you tomorrow (better to say, today!). 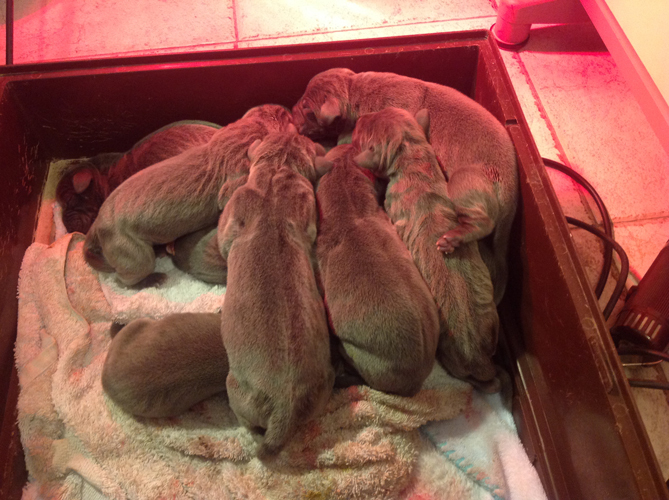 Here is the first picture: believe me, in that pile there are 10 puppies!